Miguel Berchelt and Miguel Roman not only don’t feel any pressure about living up to the Fight of the Year expectations surrounding their upcoming title clash; they’re both prepared to raise the ante. The pair of knockout artists from Mexico are set to collide for Berchelt’s 130-pound title this Saturday live on ESPN+ from Don Haskins Convention Center in El Paso, Texas. From the moment their super featherweight title fight was announced, many in the industry hailed it as a can’t-miss slugfest. It’s the one aspect of the fight on which both combatants agree. It’s reasonable for Berchelt to predict a knockout anytime he steps into the ring. The red-hot puncher from Merida, Mexico—who turns 27 later this month—has been extended the distance just once in his past 21 starts dating back to 2012. The bulk of his career has comprised of quick hits, in fact having never been past six rounds prior to his title challenge of Francisco Vargas in Jan. ’17. Berchelt validated his credentials as a leading contender, going tooth and nail with his countryman before surging late and forcing a stoppage in the 11th round to win his first title. 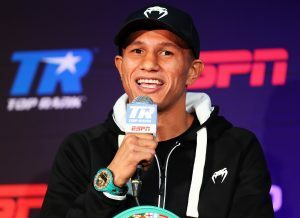 Just six months later, Berchelt would go even deeper into a contest, being extended the 12-round distance for the only time in his career in decisioning Takashi Miura. Despite having to go to the scorecards, Berchelt’s power was still evident in dominating the former champ from Japan. A pair of 3rd round knockouts have comprised of his 2018 ring campaign, both taking place in Mexico. The latter came in June against former featherweight beltholder Jonathan Barros, topping a card that saw Roman (60-12, 47KOs) extend his four-fight win streak—all by knockout—with a two-round blitzing of previously unbeaten Michel Marcano. The show was designed to build intrigue toward their eventual head-on collision, a path that began with Roman actually stepping in for his upcoming opponent on a night that forever changed his hard-luck career. Berchelt was due to defend his title versus Orlando Salido last December, only for a hand injury to force him off of the HBO-televised show. Salido agreed to an offered stay-busy fight with Roman, who accepted the assignment on less than six weeks’ notice but proved more than game for the cause. What was perceived as a Salido showcase instead turned into his forced retirement party, as Roman battered his countryman en route to a 9th round stoppage victory. The feat marked a bizarre 2017 ring campaign, beginning the year with a stoppage loss to Miura in a final eliminator—on the same night Berchelt trumped Vargas to win the strap—and then ending the year with the type of win that put him back squarely in the title picture. Berchelt is the heavy betting favorite going in, but many expect Roman to pull the crowd with the fight taking place just north of the U.S./Mexico border from his hometown of Juarez, Mexico—a city which incredibly has yet to boast a champion among the nation’s rich boxing history. The bold claims from both boxers are music to Bob Arum’s ears—especially since the Hall of Fame promoter has already established a very high ceiling for this weekend’s clash.